Amazing cover Jason, looks like a team-up!? And that cover process is one of the best things i've ever seen. Also, i've seen 3 different variants for upcoming issues and if i'm correct, they're for issues #16, #17 and #18. Excellent front cover dude. Thats brilliant. I'm so intrigued about The Face. You've posted yet another piece that invokes intrigue into what is to come. Great design I really enjoy seeing you color your own work. Looking forward to seeing it in print and in my hands when I read it. Hi Jason, I love your work in the Astoundign Wolf-Man. I love all issues and I want to ask something. 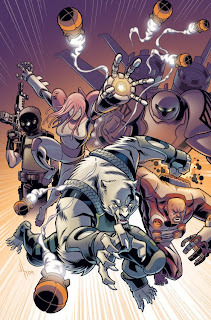 There is a way to buy the astounding Wolf-Man #1? I only don't have this issue becuase i know about wolf-man time later. Thanks all, glad you like the cover, I plan to do more process images like that in the future. Regarding the variants, yes I think that is what is going on. Honestly I don't handle those details directly and I tend to forget exactly what issue has what variant. Regarding buying issue #1, it is collected in the volume #1 trade available on Amazon. Or if you just want the issue I guess you could try some online comic shops or E-bay. Not sure where would be the best place for that. I'm getting crazy to know you made a reply! I have about 50 copies of Astounding Wolfman Numero uno. I would be glad to send you one free. Send your address to my email address. It is omit1955@yahoo.com.